Click chart for more in-depth data. 1. Oil under pressure: U.S. crude futures slipped early Wednesday as Gulf Coast refineries braced for a fresh hit from Harvey. The storm has taken 11 refineries offline and flooding has knocked off 18% of U.S. refining capacity, according to S&P Global Platts. Oil was trading 0.7% lower at $46.10 per barrel. That's more than 3% lower than before the storm. Wholesale gasoline prices have spiked as the storm made a landfall, but analysts say impact on prices at the pump should be limited. U.S. stockpiles of gas remain high. Harvey is now moving back toward southeastern Texas and southwestern Louisiana, bringing six to 12 additional inches of rainfall with it, according to the National Weather Service. 2. Japan - U.K. talks: U.K. Prime Minister Theresa May is meeting her Japanese counterpart Shinzo Abe on Wednesday. May is hoping to lay groundwork for a post-Brexit trade agreement with Japan, which is close to completing a separate agreement with the EU. Meanwhile, the third round of Brexit divorce talks will continue in Brussels on Wednesday. The talks started on a negative note, with EU chief negotiator Michel Barnier warning that the U.K. must start "negotiating seriously." 3. Markets rebound: Global markets bounced back on Wednesday, with gains across Europe and Asia. 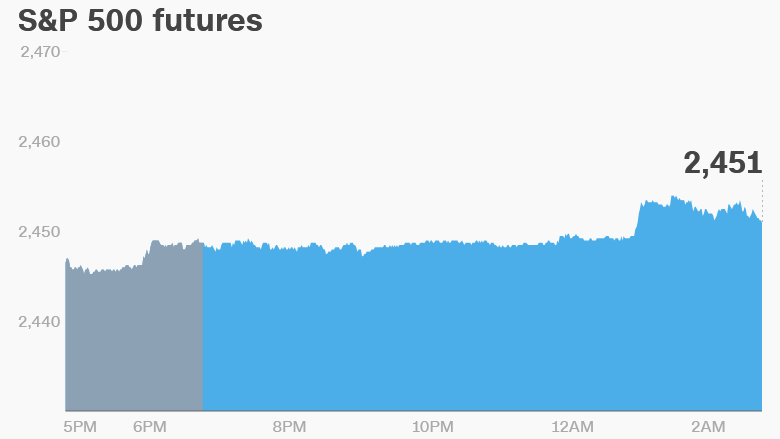 U.S. stock futures pointed to a higher open on Wall Street. The Dow Jones industrial average closed 0.3% higher on Tuesday, while the S&P 500 and Nasdaq gained 0.1%. Before the Bell newsletter: Key market news. In your inbox. Subscribe now! 4. Earnings and economics: Barnes & Noble (BKS) is set to release earnings before the opening bell. The U.S. Bureau of Economic Analysis will publish data on second quarter GDP at 8:30 a.m. ET. It's the second growth estimate for the period. Weekly U.S. crude inventories data will be published at 10:30 a.m.
German inflation data is expected at 8 a.m. Mexico's central bank will release its inflation report at 1:30 p.m.